Hailed at the time as "The flower of the south", Fairfax was remembered as an ideal southern soldier whose death was used by Confederate officials as a morale booster after he died in battle at Fredericksburg in 1862. 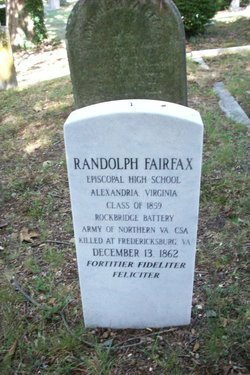 Described by those who knew him as a boy “actuated by a desire to do his duty; his conduct [was] guided by principle”, Fairfax was a beloved graduate of Episcopal High School. After attending The University of Virginia in Charlottesville and serving as a member of the school’s Southern Guard, Fairfax was eager to go to battle when the war broke out. He initially stayed in school to comply with his family's wishes. However, the call was too strong and Fairfax enlisted shortly after the first battle of Manassas. 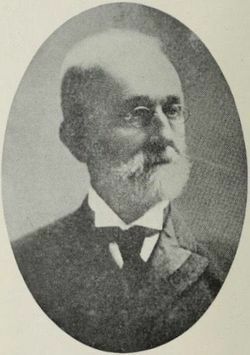 He was a private in the 1st Rockbridge Artillery alongside multiple other Episcopal graduates and was led by former headmaster General William Nelson Pendleton. Beloved by his fellow soldiers as well as his superiors, Fairfax’s death at the battle of Fredericksburg quickly brought him to prominence as a martyr for the cause of the Confederacy. His death was symbolic due to the fact that he personified what Confederates believed defined their cause. An avid scholar, devout Christian, and the spawn of a wealthy and respectable family, Fairfax still chose to join the army as a private. He had all the connections to become an officer yet he still chose to be on the front lines of the war and therefore was a perfect soldier to use for propaganda. After his death in December 1862, his memory was used to urge men to join the cause or keep pushing onward if they were already enlisted. 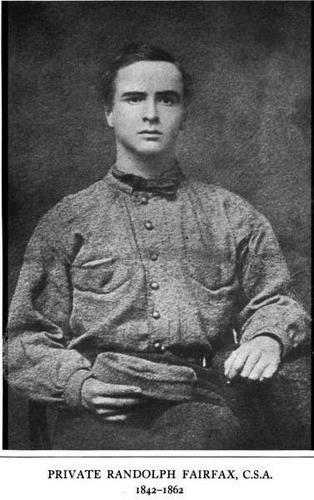 Fairfax was a young man who joined and gave his life for the Confederacy and became a poster boy of their cause. Fairfax's legacy was not only widespread throughout the Confederacy but also kept alive by those who knew him. 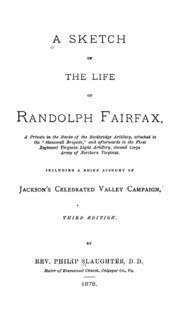 While aspects of A Sketch of the Life of Randolph Fairfax seem exaggerated for purposes of propaganda, it is true that he was loved by many who knew him. This shows through his lasting legacy at Episcopal High School thanks to Launcelot Minor Blackford, a friend who served with Fairfax in the Rockbridge Artillery and went on to be the headmaster of Episcopal High School (1870-1913). Blackford created the Randolph Fairfax Medal, awarded to the graduating senior who the faculty feel best exemplifies character, conduct and scholarship. Fairfax's headstone also bears the latin phrase Fortiter Feliciter Fideliter which is Episcopal's school motto. His impact is still felt at Episcopal today, over 150 years later.